At Fitness By The Sea, we help campers discover the best version of themselves! We offer campers a fun, engaging, encouraging environment where they can safely explore over eighty different activities to discover their natural talents and interests. Our staff members serve as mentors and role models while actively participating in all activities, to teach and model life skills that become a foundation for confidence and character. 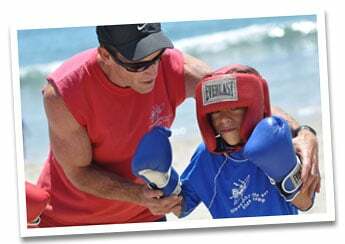 Fitness By The Sea was the first beach camp in Southern California to allow campers to choose their own activities throughout the day. By offering campers “The Power of Choice,” they develop self reliance, confidence, and leadership abilities as they actively explore the FBS world. More than just a mascot, the dolphin is a living example of strength, courage, resilience, family, and of course, FUN! Nearly every day as a pod of dolphins appear in the ocean, our entire camp stops to catch of glimpse of these graceful animals, offering a teachable moment to our staff, and a reminder of our lofty values. Throughout the season, campers discover these values in themselves as they develop crucial social skills for becoming happy, successful adults. It’s not uncommon for parents to observe their children developing the qualities of an adult before their very eyes. This is the enduring legacy of Fitness By The Sea. But campers don’t seem to notice their development because they’re too busy having fun! Learning social skills, gaining responsibility and resilience, and mastering coping skills are all advances that happen at camp. These create the foundation for the positive development of children: feeling successful, making new friends, gaining new skills, getting along better with others, and discovering one’s talents. As a result of their summer at Fitness by the Sea, we want campers to use more positive, specific, and supportable words to describe themselves. We also want to help them to develop a more optimistic self-image. We can all reinvent ourselves and be anything (or anyone) we want to be! And we can do it all at camp! Because at FBS, we make sure that everything we do is not just safe for knees and elbows, but for feelings too!